Oh yeah, mum is arriving here tomorrow, this is a surprise visit that was only arranged this past week. She has just recently gotten in contact with friends of hers from her College days in Norway, and then her closest friend from those days got himself a job of a ship to Australia (as an engineer) and is arriving in Perth on tomorrow, then flying over to Melbourne very early Sunday morning to meet us all. He could have flown to Adelaide, so I'm very grateful he is coming over here and paying for Mum and Lester to come over too! Oh, and here's a funny. Lots of people have recently told me I look like my mum... Well, today I certainly did!!! In this pic, you can basically see what my mum looked like in her twenties (no, I'm not claiming to look like *I'm* in my twenties)... In fact, somewhere in the archives of our old photos I'm sure there is one of mum wearing jeans, a shirt not unlike mine, and with her hair in two pigtails... The boys said I looked like a little girl (which they thought was a good thing apparently).... So, anyway, the metamorphosis is complete! Well, guess who made a liar of me TODAY!!! LOL, was on the phone to my mum, and Dave had Bryn and had come to sit next to me on the couch. Bryn immediately started motioning to coming over to me, but I was ignoring him, and then suddenly, clear as a bell he reaches out to me and goes, "Mama, Mama!" in that complete, "I'm talking to YOU!!!" tone of voice!!! Hahahahaha! It's his first OBVIOUS and CLEAR word!!! 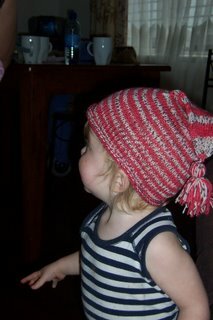 Sif, what gorgeous hats, I will have to commision you to make one for my friend who is due for her baby in less than a month (eek!) She would love one! And what a cute model you have as well!!! At the risk of sounding like a broken record, I cannot get *over* how fab you look! Those jeans look positively *loose* on you! We must catch up for a walk some time soon - maybe next week? I will carry Bryn for the extra work out I so desperately need LOL!